Circular Brush of crimped wire with suitable keyway in stainless steel wire , carbon steel wire, nylon wire in various sizes. The offered wheels are sourced from most authentic vendors in the market and are precisely engineered using supreme grade metal and ultra-modern tools in compliance with set industry norms. We offer these wheels in number of sizes and designs in order to meet vast necessities of our valuable clients. 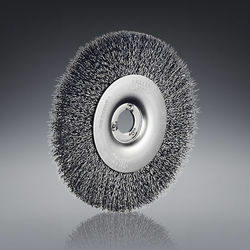 Having a vast experience of this industry, we are engaged in providing a quality range of Circular Brush. These offered product range are designed and developed by using high grade of raw material. These quality range are widely known for their high performance in market. 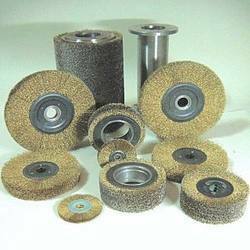 Industrial Circular Brush provide consistent accurate surface finish control for metal processing tasks like annealing galvanizing scrubbing pickling coil casting and many other application they are custom built to your specifications. 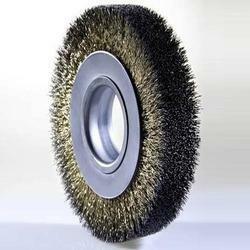 These helically wound brush feature a hard working welded one piece construction Designed for arbor mounting in your plant for fast easy removal and replacement keeping your process interruptions to a minimum. The dense fill and excellent balance of brush provide a uniform finish lower vibration highter operation speed closer control of the brushing process and higher brushing efficiency to keep the finishing costs down. 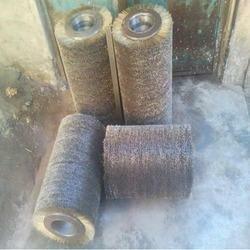 We have earned proficiency in providing our patrons with Circular Wire Brush. Obtainable in different designs, sizes and shapes at market leading rates, all our brushes are designed using premium grade raw material and pioneering technology. We also test all our products on various quality parameters to make sure faultlessness. Furthermore, our brushes can be customized as per the stipulations laid down by the patrons. 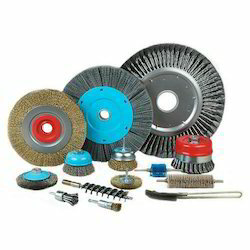 Our team of professional holds expertise in providing a wide assortment of Golden Circular Wire Brush used for cleaning purposes in different sectors of industry. Premium quality material and ultra-modern technology is been used for developing these brushes in compliance set with industry standards. In addition to this, we design these brushes in different shapes and sizes. Customers can buy them at pocket friendly rates.